One way to try Kobe beef is having it teppanyaki style. What is "teppanyaki" you might ask? It's thinly sliced steak cooked on an iron plate. Teppanyaki in it of itself is a must-try in Japan, so having it with Kobe beef is pretty much la crème de la crème! Hakushu Teppanyaki is only 3 minutes from Shibuya station. And it is simply superb! The owners are incredibly friendly and the service was perfect. It's a bit pricey, but teppanyaki is in general, and this is worth it! BBQ is a fun thing to try in Japan as well. You have a grill at the centre of the table, and you grill the meat while you chat away with your friends. This, in general, implies a few beers, and is a fun activity with friends. Ikuta is probably one of the best places to try Kobe beef BBQ; it's very central, right in Yoyogi. A plate of Kobe beef starts at ¥980, you can order until you're full. Once again, shabushabu and sukiyaki are a must-try in Japan. "Shabushabu" is thinly sliced pieces of meat and vegetables that you cook yourself in a broth at the centre of the table. "Sukiyaki" is meat and vegetables that are simmered at the centre of the table, usually with a raw beaten egg. Now, if you want the top-notch experience, you should try it with Kobe beef. It will truly make it a memorable culinary experience. Seryna in Roppongi is a great place to try Kobe beef shabushabu. The Kobe beef shabushabu course is ¥18,360; and sukiyaki is ¥20,520. Beef bowls are very popular dishes in Japan and you can try the generic version of it right about anywhere in Tokyo. Have you been to Roast Kobe beef Ohno Akihabara to try the fancy version? But this version is completely worth the price. It is ¥1,500 for a beef bowl, and it even comes with some side dishes. Another fun way to enjoy kobe beef is to have it on top of ramen! Can you imagine something more Japanese? 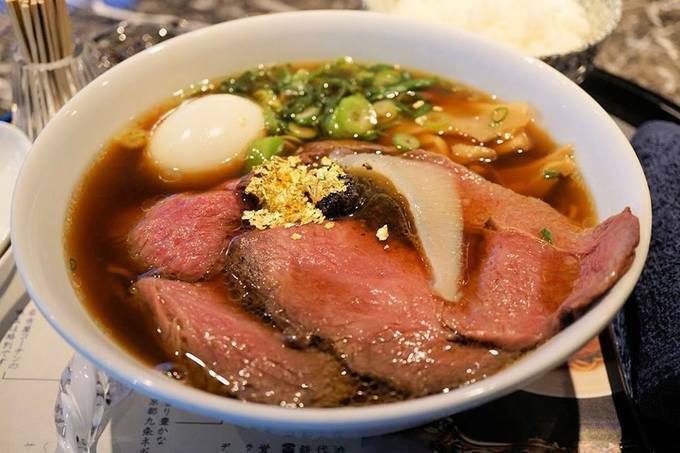 A big bowl of delicious ramen topped with a thick juicy slice of kobe beef. And for lunch, a bowl is only ¥980! You can also come back for dinner and have it as teppanyaki (slices of beef grilled on a iron plate). While you're in fancy Daikanyama, why not walk around and enjoy the beautiful cafes surrounding the area. Or even stop by the huge Tsutaya bookstore to browse for a few hours. American Dining EAT, is the place to go to try Kobe beef burgers! Located in Kita-Aoyama, close to the Gainemae station, this restaurant can be easily located because of the flashy yellow letters out front. The Kobe burger is ¥1,900 is a little pricey, but hey it's totally worth every penny!